This article is by a friend of the show, Mona Salama. Bay Ridge Community Council in Brooklyn organized their annual Great Debate, where candidates for Congress, State Senate and Assembly debate and answer questions to let voters know their stands on current affairs. The headliner debate was the congressional race, the first head-to-head debate, however the challenger refused to show up to debate the Congressman. Dominic Recchia, a former councilman in Brooklyn, is the Democratic opponent trying to replace two-time elected Congressman Michael Grimm. Recchia announced the night before that he would not be attending the debate stating a scheduling conflict. Not stating what the scheduling conflict was about, the no-show challenger gave Congressman Grimm the stage to himself. The Congressman was given questions asked from the audience prior to the debate to answer in a one-minute time frame on issues covering foreign policy, Sandy recovery, national security, illegal immigration, national debt and the Affordable Care Act. Grimm attacked Obama for lack of foreign policy where it led ISIS to embolden to attack the U.S. On immigration, the Congressman is for securing the borders in which he states it was put to vote by Congress and approved and waiting for the president to seal the border. 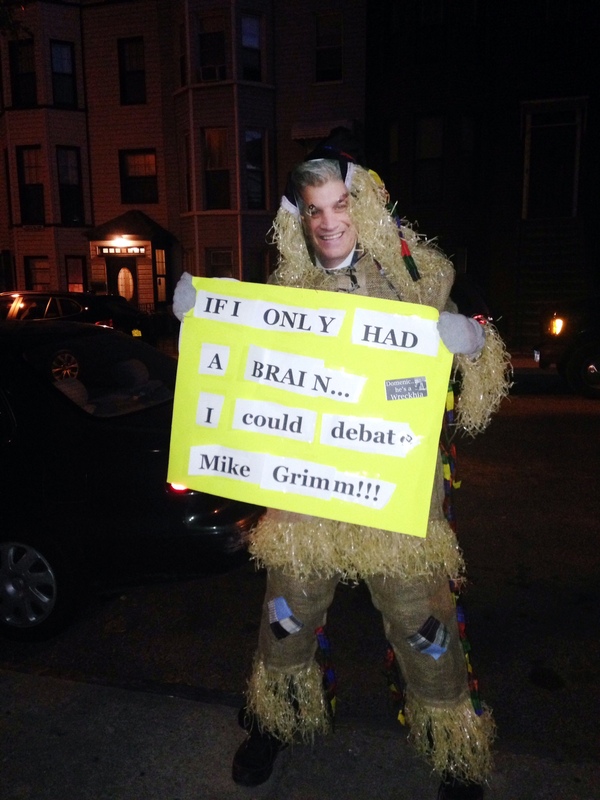 Some of the answers from Grimm pointed out that his opponent was out of touch with issues and aligned with policies of the likes of President Obama and Mayor Bill de Blasio. With the Affordable Care Act, Congressman Grimm stated it was forced upon us that have destroyed hospitals and small businesses. ACS needs to be repealed and replaced; for the current health care system was a good system that needs minor improvement. He was able to cite his record as an elected for stellar constituent services after Hurricane Sandy with bills that provided $60 billion aid relief funding and the fighting tool and nail to keep the Fort Hamilton army base unit in Brooklyn from being shut down. Earlier before the debate, a NY1 reporter asked Recchia on the campaign trail on why he wouldn't be attending the debate that night. Recchia confused with the question even though he was asked three times and the only answer was that he "ready to debate Grimm". Funny how he states he is ready to debate the Congressman but failed to attend the first head to head debate. Well, let's see what happens in the next debate to be scheduled October 22 and if he can answer the question straightforwardly, without mumbling an incoherent answer, especially on foreign policy, such as explaining what the Trans-Pacific Proposal (TPP) in which Recchia’s non-clear statement, "...made in America to manufacture more in America is better for this country". With the issue of Syria, Recchia continued to stumble on answering this issue stating, “sending troops to Syria should be a last resort and we have many different, you know, that’s what we want, you know, options available to us." Guess the DNCC needs to put money into prepping Recchia with talking points on foreign issues. But then again the Democrats really don’t have any talking points or any realistic points on foreign issues. No one is more disappointed in businessman Grimm right now than Candidate Grimm, who looks to connect himself to President Ronald Reagan. So too, no one is more disappointed in candidate Recchia right now than councilman Recchia, who wasn't afraid to say the words, tax and spend. Tired of status quo politics? Write me in this November for the 11th CD. Not sure how to write me in on the old lever machine or the new paper ballot? This link explains how.